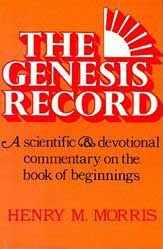 The Genesis Record is probably the best and most widely used complete modern commentary on the foundational book of the Bible. The reader is conducted by a capable guide through the important corridors of Earth's early history, providing the background so necessary in understanding all of Scripture. With its narrative-type exposition, it is easy to understand, yet has persuasive answers to all scientific difficulties and other problems, showing Genesis to be literally and historically accurate throughout.